In the process of Youth and environmental of NAFSO there was a youth activity program in the district of Mathara, Organized by NAFSO Mathara district partner organization Southern Fisheries Organization Mathara as a leadership training program as well as mainly District youth committee was established in this long term process with this youth and environmental programs to build a National YOUTH MOVEMENT FOR SOCIAL CHANGE (Y-MESOC). It was held at GRAMA SANWARDANA Training center in in Dikwella in 7th-8th May. There were around 60 youths from various divisions I the district. 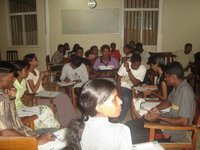 There main Facilitators were Mr. Amarasigha Ekanayake and Mr. Herman Kumara the National convener of NAFSO in the whole program. National convener was addressing all the participated youths in respect of the responsibilities of the Yong lives and they were educated how to face challenges as well as achieve our goals in this process. This whole program was coordinated by the National Coordinator for Youth and Environmental Activities Mr. Luksiri Fernando We would like to inform youth socities all over the world to joing with us get our membership to build a sustainable youth movement in the world.